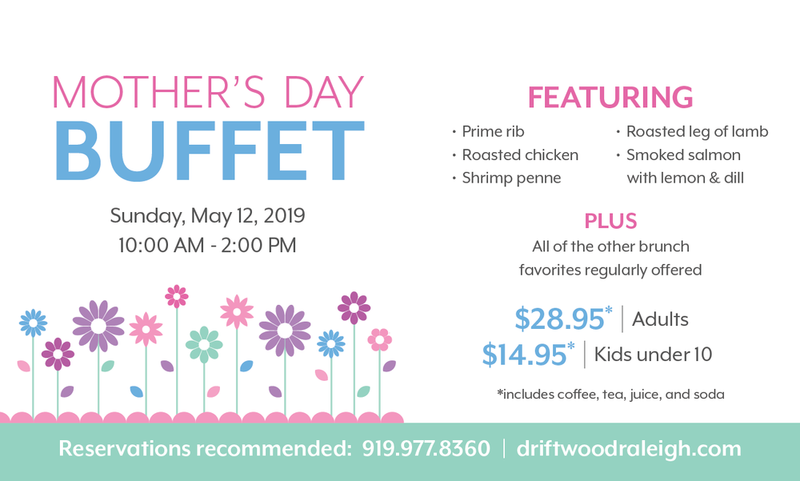 Brunch buffet will include smoked brisket, ribs, make your own pulled pork sliders, fried chicken, pimiento cheese, baked beans, corn on the cob, and all of the other brunch favorites regularly offered. $24.95 adults $12.95 kids under 10 (pricing includes juice, coffee, tea, soda). Reservations recommended. Join us for Valentine's dinner. We are offering a Valentine's Dinner menu with some new features and other Driftwood favorites. Reservations recommended. Close out 2017 and join us for a New Years Eve brunch buffet. All of your Driftwood brunch favorites along with Shrimp & Grits, Smoked Brisket, and Sausage & Chestnut Stuffing. Adults $19.95 and Children 10 and under $10.95. Reservations recommended. **Please note** We are closed for Dinner on the 31st. We are also closed New Years Day and the 2nd of January. We will reopen Wednesday, January 3rd for normal business hours. Join us for a Christmas Eve brunch buffet. All of your Driftwood brunch favorites along with Salmon, Prime Rib, Leg of Lamb, Shrimp Cocktail and Smoked Salmon. Adults $26.95 and Children 10 and under $14.95. Reservations recommended. **Please note** We are closed for Dinner on December 24th. We are also closed Christmas Day. We will reopen Tuesday, December 26th. Outside the restaurant, there will be whole pigs on the smoker. We will be serving shredded pork bbq, pasta salad, potato salad, house chips, beer, and wine. Cure your hangover with a special new years day brunch buffet! The traditional breakfast items like eggs, biscuits, sausage gravy, and french toast along with smoked meats, and mac & cheese. Outside, in the courtyard, there will be food and live music. BBQ plates with Ribs, Pulled Pork, and two sides for $15.00. Outside The Beltline will be playing live music from 2pm – 6pm. Alcoholic and non-alcoholic beverages will also be sold. Driftwood will be hosting a brewery with beer for sale on draft. We will also be featuring our moonshine cocktails. Promo available until the new year! Call 919-977-8360 for reservations. Details to come. Beer and Food specials in the courtyard. Here is a link to the events near us.